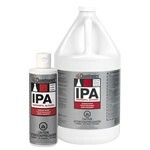 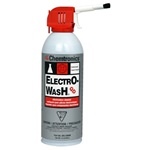 Chemtronics manufactures a wide range electronic cleaners. 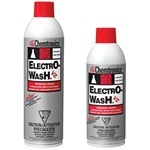 From clean room cleaning supplies to production quantity flux removal or even blasting derbies from sensitive electronics with compression dusters we are your one-stop shop for the care of your electronic equipment. 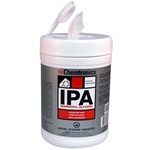 Chemtronics® dusters are microscopically clean, oil and moisture free sources of "canned air" developed for applications where safe, ultra-pure cleaning is required. 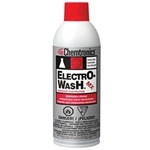 Compact and portable, Chemtronics dusters deliver powerful jet action to instantly remove particles from even the most inaccessible areas. 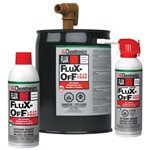 Ultrajet® Dusters economize solvent usage by removing layers of dry particulate allowing the solvent to work immediately on encrusted soils. 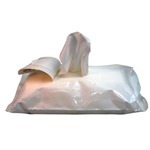 Ultrajet Dusters also accelerate surface drying when using slow evaporating cleaners. 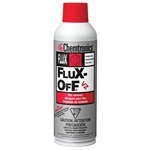 Flux removal is critical to ensure reliable circuitry. 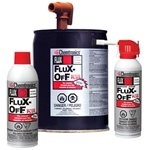 Not only unsightly, some flux residue can promote short circuits and corrosion, degrading or destroying the printed circuit board. 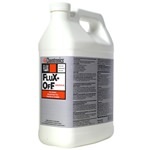 The type of flux to be removed, solvent compatibility and ease of application are all factors to consider when choosing a flux remover or electronic cleaner. 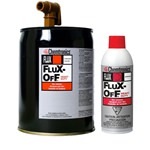 Flux-Off® Flux Removers are specially formulated to remove all types of lead-free, rosin (types R, RA, and RMA), no-clean, water-soluble and synthetic (type SA) flux. 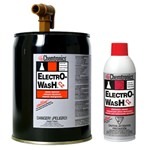 Electro-Wash® Cleaner Degreasers are engineered to clean a wide variety of soil, oil, grease, oxides and handling contamination, from equipment and assemblies. 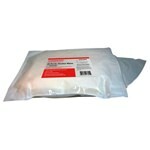 Chemtronics Swabs and Applicators are engineered for use in a variety of environments and applications. 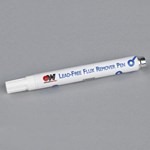 They are ideal for use with our cleaner degreasers, head cleaners, flux removers and other solvents for fast, precision cleaning. 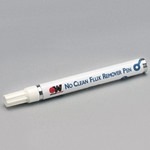 From the innovative no-lint Chamois Tips Swab to the general purpose Cottontips Swab, Chemtronics has the right swab or applicator for your job. 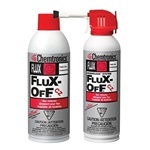 Non-ozone depleting, nonflammable flux remover spray safe for use on plastics.